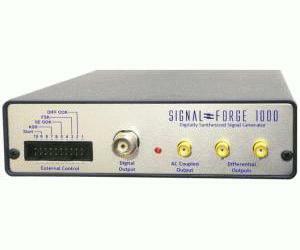 The Signal Forge 1000 combines a 1 GHz (2.6 GHz with frequency expansion module) frequency range with three dedicated outputs to deliver the capabilities a signal generator, a sweep generator and a function generator in a single, high-performance system. circuits. And with its single-tone waveform and wide frequency range—starting at 1 Hz—the SF1000 is an accurate and stable signal source for testing audio systems, receivers and other radio frequency applications. The SF1000E requires an external clock source.